Just steps from the coast of Miami Beach, Acqualina Spa by ESPA is offering a romantic spa treatment for couples in the spa’s Royal Spa Suite. Guests begin their romantic journey with a personal consultation with a professional ESPA therapist to customize a two-hour Time Journey, which can include a full-body exfoliation, body wrap, massage, scalp exfoliation and/or facial—all tailored to the guests’ needs and desires. Guests will depart with a complimentary ESPA gift bag. The Royal Spa Suite features a private steam room made of mother-of-pearl, a rainforest shower for two, separate welcome lounge and bathroom area, furniture by Fendi, and a private wraparound balcony with exquisite views of the Atlantic Ocean. Cost is $325/person, and the service is available through February 28, 2019. To book, visit the resort’s website or call 305-918-6844. Couples are invited to a luxurious pampering session at Balboa Bay Resort in Newport Beach, California. 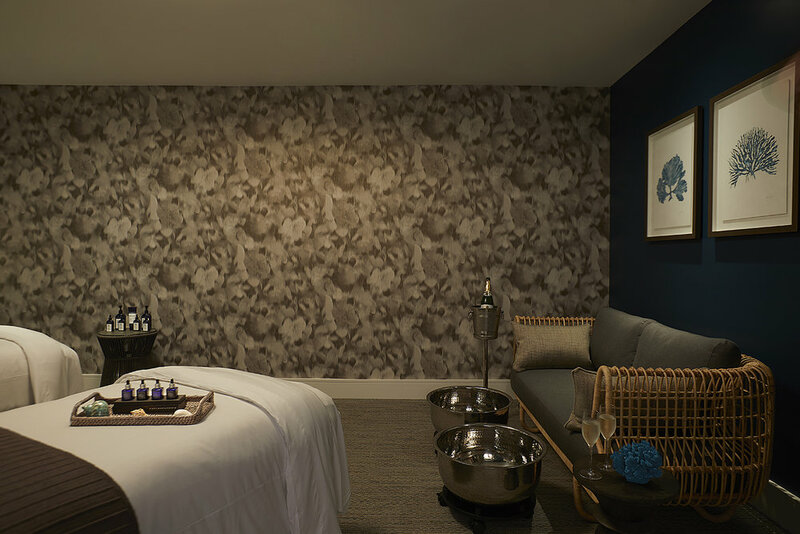 Exclusively available from February 13 - 17, 2019, couples can relax and reconnect with the Signature Balboa Couples Massage, indulge in a glass of champagne pre or post-treatment, and will receive a special gift from The Spa at Balboa Bay Resort. Cost is $350/couple, gratuity is included. Advance booking recommended. Based on availability. To book, visit the resort’s website or call 949-645-5000. The Bamford Haybarn Spa at 1 Hotel South Beach. On February 14, couples can treat each other to an intimate spa day together this Valentine’s Day at the Bamford Haybarn Spa, located at 1 Hotel South Beach in Miami. The spa is offering a special two-hour Valentine’s spa day experience for $325, which includes a 50-minute Aromatherapy massage, 50-minute custom organic facial, and a complimentary glass of bubbles. Additionally for a limited offer, every Indulgence Package booked during the month of February will receive two glasses of bubbles and chocolates. To book, visit the hotel’s website or call 305-604-6792. BATHHOUSE Spa at Delano Las Vegas. Available throughout the month of February at BATHHOUSE Spa in Delano Las Vegas, the Sweetheart Package includes a 50-minute Sweetheart Massage, a 50-minute Love Your Skin Facial, and a 50-minute Heart and Sole Pedicure—all topped off with a complimentary box of chocolate truffles. Cost is $360 per person. To book, visit the spa’s website or call 877-632-9636. To book, visit the spa’s website or call 702-693-7472. At the newly reopened Bergamos Spa Retreat in Friendswood, Texas, guests can choose from four different 3.5-hour Valentine’s Day Couples Packages: Valentino (Therme’ Wellness Circuit, reserved space in lounge, side-by-side massages, two Tuscan Foot Renewals in the salt cave, wine and dessert at wine bar); Amore (Therme’ Wellness Circuit, reserved space in lounge, side-by-side massages, two Tuscan Foot Renewals in pedicure chairs, wine and dessert at wine bar); Bellisimo (Therme’ Wellness Circuit, reserved space in VIP suite, side-by-side massages, two facials, wine and dessert at wine bar); and Sii Mio (Therme’ Wellness Circuit, reserved space in VIP lounge, side-by-side massages, Quartz Table or Body Scrub, wine and dessert at wine bar). Cost ranges from $350 - $425. To book, visit the spa’s website or call 281-992-3775. Burke Williams Spa is offering three special Gift Card Packages. Enjoy “Love Always” for $350 (valued at $445), including an 80-minute Pure Relaxation massage and an enhancement of choice, an 80-minute Spa Style Facial with an Advanced Eye Lift Enhancement, and a $25 H2V Skincare bonus gift card. To book, visit the spa’s website or call 1-866-239-6635. For the week of February 10, 2019, Cal-a-Vie Health Spa in Vista, California is offering several co-ed packages for two ranging from three to seven nights at the luxurious destination health spa resort. Packages include accommodation, meals, unlimited fitness classes, nutritional lectures, cooking demonstrations, roundtrip transportation between San Diego International Airport and the resort, and spa services. Cost ranges from $2,475 to $9,950. To book, visit the spa’s website or call 888-373-8773. The Spa at Carillon Miami Wellness Resort. This exotic and private 45-minute treatment will be performed by just you and your partner in the private Rhassoul Chamber at The Spa at Carillon Miami Wellness Resort. This steamy, time-choreographed, thermal experience begins with a couple’s shower and is followed by an aromatic salt scrub exfoliation. Afterwards, couples will take turns applying a skin softening and detoxifying mud treatment to one another before stepping into a gentle steam, which is followed by a warm shower finale. Cost: $149 per couple. To book, visit the spa’s website or call 866-276-2226. Celebrate the month of love with a special Wellness Together Package at Chable Resort in Mexico’s Yucatan, which is available for stays between February 1 – 28, 2019. The romantic spa getaway includes a three-night stay in luxury accommodations with a private plunge pool, a 60-minute Relieving Couples Massage followed by a 30-minute soothing float in the flotarium, a one-hour Mayan spiritual ceremony for couples, a seven-course tasting menu and wine pairing at the hotel’s Ixi’im Restaurant, one complimentary room service dinner for an intimate night in, a one-hour couple’s yoga and meditation session, daily breakfast, and round-trip transportation to and from Merida International Airport. Cost is $3,881. To book, visit the resort’s website. Chateau Elan Winery & Resort. To book, visit the resort’s website or call 678-425-0900. Relaxation is even sweeter at Chuan Spa, Langham Chicago this Valentine’s Day as the team creates a romantic lounge filled with chocolate-covered strawberries, sweet treats, prosecco, juice, coffee and tea. Experience a tri-Bathing Ritual located within each changing room that features steam rooms, sauna, and relaxation amenities. Additionally, enjoy lap pool, whirlpool and fitness center access. Each treatment will incorporate a Loving Langham Pink Rose Quartz Antioxidant Collagen Eye Treatment, and each guest will receive a special gift upon departure: a single wrapped rose and limited-edition Chuan travel candle. Special spa services offered include a 50-minute Chuan Spa Signature Loving Langham HydraFacial Premiere Treatment, Chuan Signature Loving Langham Couples Massage, Chuan Signature Loving Langham Refresher Body Scrub, and Chuan Signature Loving Langham Hand & Foot Treatments. To book, visit the spa’s website or call 312-923-7650. 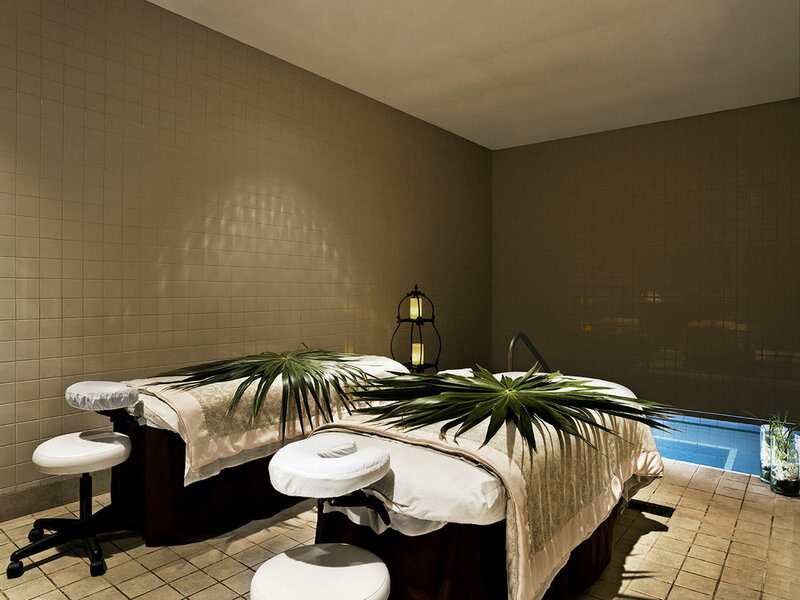 Chuan Body + Soul Spa at Langham, New York, Fifth Avenue. This special package at The Langham, New York, Fifth Avenue includes luxurious accommodations in the hotel’s oversized guest rooms; a complimentary bottle of champagne upon arrival; breakfast for two from Private Kitchen, The Langham’s extensive in-room dining menu; a box of Charbonnel et Walker Pink Champagne Truffles; a Langham teddy bear to take home as a souvenir; and an additional $150 hotel credit, which can be used for a variety of hotel services including at the hotel’s state-of-the-art Chuan Body + Soul Spa. To book, visit the hotel’s website or call 212-695-4045. Experience special prices on signature spa offerings at Chuan Spa, Langham Pasadena from February 14-16, 2019 for the ultimate romantic retreat this Valentine’s Day. Treatments include a complimentary glass of champagne. Among the Spa’s many offerings include a 50-minute Ginger Wrap ($195), 50-100 minute Couples Swedish Massage ($370-$740), and 50-100 minute Couples Deep Tissue Massage ($410-$820). To book, visit the spa’s website or call 626-585-6414. To book, visit the spa’s website or call 213-265-7908. The Dolder Grand Spa in Switzerland. Overlooking bustling European metropolis Zurich, The Dolder Grand offers a celebration of love with luxurious touches. A notable treatment perfect for lovebirds is the over-the-top Meet Me at Midnight. The luxurious package offers couples the opportunity to enjoy the spa entirely on their own and after hours: complete with champagne, chocolate strawberries, candlelight and rose petals, couples can indulge in the spa’s offerings such as the sauna, Snow Paradise, or large pool. To book, visit the spa’s website. Drift Spa at The Waterfront Beach Resort. From February 1 - 17, 2019, Drift Spa at The Waterfront Beach Resort, a Hilton Hotel in Huntington Beach, California is offering several special Valentine’s Day-themed services, including a BFF Couple’s Massage ($475 per couple); Roses and Rosé (Elemis anti-aging facial), and the Drift Classic Massage for Two, which comes with complimentary champagne ($475 per couple). To book, visit the resort’s website or call 714-845-8000. This luxurious massage offered by ESPA at Vdara in Las Vegas is designed to soothe away life’s stresses and balance the heart chakra. 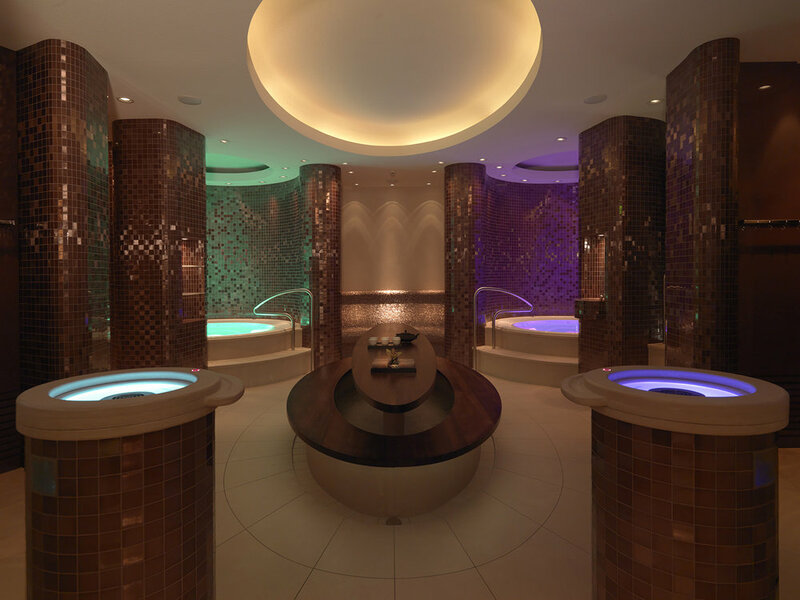 The treatment includes a therapeutic hot stone using ESPA’s Restorative Oil, which contains rose, geranium and palmerosa to balance and calm the mind, and a relaxing scalp treatment. A rose quartz heart crystal is placed over the heart to balance the heart chakra, which guests can take home with them after the service. Cost: 50-min/Mon-Thur ($175), Fri-Sun ($185); 80-min/Mon-Thur ($240), Fri-Sun ($260). To book, visit the spa’s website or call 702-590-2474. The Spa at Four Seasons Hotel Gresham Palace in Budapest. Indulge your loved one in a memorable experience with a 75-minute Therapeutic Couples’ Massage in one of the Danube River view rooms at The Spa at Four Seasons Hotel Gresham Palace in Budapest. The peaceful and romantic environment will set the perfect scene for an unforgettable Valentine’s Day experience. The fragrant signature blend of essential oils with frankincense, bergamot and calendula adds a long-lasting soothing sense and leaves the skin deeply nourished. Available from February 13 - 15, 2019. To book, visit the spa’s website or call 36 (1) 268-6000. Rhythm & Hair Salo at Four Seasons Westlake Village. Give a sweet treat to a Valentine that tastes as good as it will look and feel. 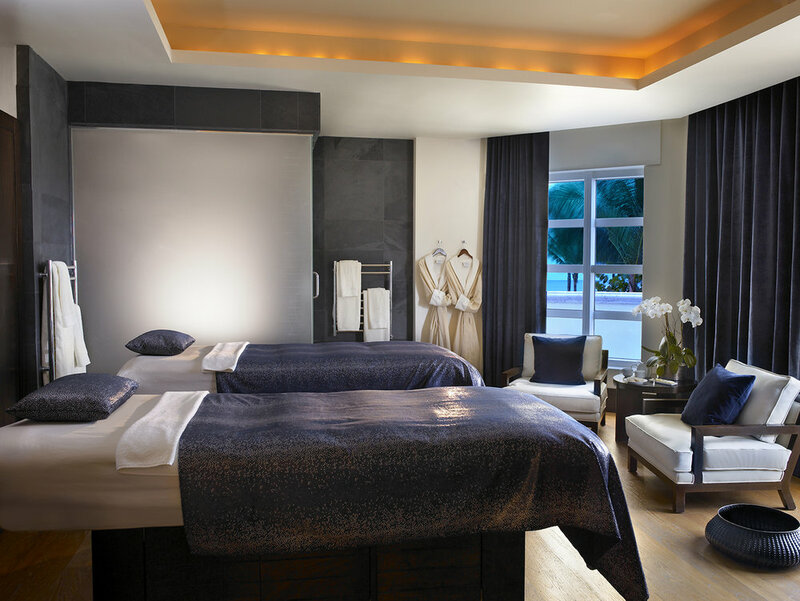 Enjoy a 30-minute treatment at Four Seasons Hotel Westlake Village in Westlake, California that includes a relaxing manicure that includes a warm watermelon and basil skin scrub. Skin will then be hydrated and massaged with shea butter and a rejuvenating jojoba melt followed by nail colour of choice. During this indulgent treatment enjoy a bubbly Mimosa and house-made macaroons from Chef Patrick Fahy. Cost: 30-minute treatment is $60. The property is offering other special Valentine’s promotions, including a Wine & Dine Experience for couples at the California Health & Longevity Institute, and more. To book, visit the spa’s website or call 818-575-3000. Nestled in the Swiss Alps and idyllic town of Bad Ragaz, Switzerland, Grand Resort Bad Ragaz is the perfect relaxing destination for Valentine’s Day. The leading medical wellness center in Europe runs on the natural thermal waters from Tamina Gorge, and couples will enjoy soaking up the natural minerals and healing properties in the Thermal Spa. To add to the romance for Valentine’s Day, lovebirds can enjoy a private spa with a whirlpool, hydromassage shower, steam bath, sauna, home cinema, and private treatment and dining areas. The Spa at Hard Rock Hotel Davos. Celebrate with the one you love at Hard Rock Hotel Davos in Switzerland. The hotel is located in a 130-year-old building that has been transformed into a modern, alpine escape where you can cuddle up and enjoy hot cocoa by the fire. Package includes: 50-minute couples massage at the brand-new Rock Spa, sweet & bubbly turndown surprise, Rock Spa amenity basket, and breakfast in bed. To book, visit the hotel’s website or call +41-81-4151600. Westin Grand Cayman Seven Mile Beach Resort & Spa. Loved ones will enjoy their own private Jacuzzi for 30 minutes and then feel all their cares melt away while relaxing side-by-side in the couple’s spa suite at the Hibiscus Spa at Westin Grand Cayman Seven Mile Beach Resort & Spa in Grand Cayman. The romance continues when couples choose between a Swedish or Aromatherapy massage for 60 minutes with sparkling wine included. To book, visit the spa’s website or call 345-945-3800. From February 11-15, 2019, Hotel Bel-Air Spa will offer a special two-hour treatment called Beloved Bliss that includes Valmont's Hydration Facial and Bel-Air Gardens Pedicure. Cost: $325. To book, visit the spa’s website or call 310-909-1681. Innisbrook Golf & Spa Resort. Pamper yourself and a loved one this Valentine’s Day at Innisbrook, a Salamander Golf & Spa Resort in Tampa, Florida with adventures that will leave you feeling relaxed and rejuvenated. The Salamander Spa Destination Package includes: luxury accommodations; two 50-minute spa services per person, per night; access to fitness facilities, scheduled classes, swimming pools and spa facilities; as well as a spa gift, tote bag and water bottle. Cost starts at $239 per person/per night. To book, visit the resort’s website or call 888-794-8627. Kelly’s Spa at The Mission Inn Hotel & Spa. Kelly’s Spa at The Mission Inn Hotel & Spa in Riverside, California is offering a special two-hour Valentine’s Day package that includes two 25-minute body polishes, two 25-minute aromatherapy baths, one 50-minute couples massage, private access to the Mission Inn’s poolside villas, complimentary champagne and chocolate-covered strawberries, and full access to Kelly’s Spa facilities. Cost is $520 per couple. To book, visit the spa’s website or call 800-440-5910. Looking to knock it out of the park with an unforgettable one-of-a-kind experience for Valentines day? Larchmont Sanctuary Spa in Los Angeles is offering several luxurious romantic movie-themed Couples Packages. The packages are: "Crazy, Stupid, Love" (couples copper jacuzzi soak with sparkling rose, 60-minute couples Head Over Heels Massages, take-home Himalayan bath salts); "Shakespeare in Love" (couples copper jacuzzi soak with sparking rose and chocolate-covered strawberries, 60-minute couples Himalayan Salt Stone Massages, couples reflexology or scalp treatments, and take-home Himalayan salt candle holder); and "A Star is Born" (couples copper jacuzzi soak with sparking rose and chocolate-covered strawberries, 75-minute couples Aromatherapy Massages, Couples Roses Are Red Facials, and a take-home sanctuary candle). Prices range from $379 to $675. To book, visit the spa’s website or call 323-466-1028. Loews Ventana Canyon in Tucson, Arizona. For the active loved one in your life, Loews Ventana Canyon’s Putt and Pamper package provides the best of both worlds with world-class golf and one-of-a-kind spa treatments. After a day of hitting the links, you and your Valentine can enjoy a day at Lakeside Spa with some much-deserved R&R and experience the healing benefits of the desert with indigenous treatments like the Aloe Vera and Blue Corn Healer. To book, visit the spa’s website or call 520-529-7830. Loews Minneapolis Hotel is offering the chance to enjoy some relaxation and rejuvenation with the Couples’ Bliss Spa Package. The Embury Spa Harmony Suite offers the opportunity of having your spa treatment in the company of your special someone. The package includes overnight accommodations in a luxurious guest room, an indulgent spa treatment for two including dry brush exfoliation, an 80-minute massage for each person, a Pino facial mask, steam shower, a glass of champagne served in the spa, and a bottle of champagne delivered to your guest room with a box of two chocolate truffles. To book, visit the spa’s website or call 612-312-1131. Miri Miri Spa by Clarins at St. Regis Bora Bora. Share a moment specially tailored for romance at Miri Miri Spa by Clarins at The St. Regis Bora Bora Resort with a special 90-minute Valentine’s Day package that includes: private balneotherapy, complimentary bottle of champagne and delicious chocolate Mignardise, 60-minute Chocolate Oil Massage Experience, and enjoying services in either an indoor candle light treatment room (9:30 a.m. - 5 p.m.) or an outdoor candle light gazebo (after 5 p.m.). Valid from February 1 - 28. 2019. Cost: 49,000 xpf/per couple. To book, visit the resort’s website or call +689-40-60-78-88. The Spa at Mandarin Oriental, Boston. The signature couples suite at The Spa at Mandarin Oriental, Boston provides unparalleled serenity and features a private sauna, oversized soaking tub, two treatment tables, and a daybed for relaxation. The Couples Serenity experience includes a personalized Time Ritual or Signature Spa Treatment with choice of herbal body scrub, body treatment or massage, and one-hour of relaxation time with seasonal fruit refreshments. Couples that book this experience during the month of love will also enjoy complimentary chocolate-covered strawberries during their relaxation time and will be gifted a Dossage candle to continue their spa experience at home upon departure. Valid February 1 - 28, 2019 (Monday-Thursday only). To book, visit the spa’s website or call 617-535-8820. Love from Head-to-Toe at Mandarin Oriental, Washington D.C. The Spa at Mandarin Oriental, Washington DC. The Spa at Mandarin Oriental, Washington D.C. invites you to kiss stress away with a Valentine’s Day couples massage in a secluded, off-spa suite. The treatment is available from February 10-17, 2019 and begins with a relaxing foot massage, followed by a customizable massage journey and complimentary gift. The Valentine’s Day Couples Massage lasts 50 minutes and starts at $390. To book, visit the hotel’s website or call 202-787-6100. To book, visit the hotel’s website or call 435-604-1300. Located in the heart of Lowcountry, Montage Palmetto Bluff is a private and relaxing getaway to experience with loved ones this Valentine’s Day. Offering a Just for Couples Menu, Spa Montage Palmetto Bluff provides lovebirds with an array of treatments from facials to massages to pedicures, making for the perfect place to sit back and relax with some much-needed quality time. The Loves Jubilee Package is a 2.5-hour treatment providing couples with exfoliation, soaks, and massages; couples can also choose from His & Her Kur, and a Lovers Bath and Massage. To book, visit the resort’s website or call 855-264-8705. Spa at Niyama Private Islands Maldives. At Niyama Private Islands Maldives, couples can enjoy a special Valentine’s Day Package that includes: minimum three nights’ stay in an over-water pool villa, champagne toast upon arrival, daily buffet breakfast for two, private destination dining at a secluded area on the beach, 60-minute spa ritual for two, and so much more. The package starts at $2,235. To book, visit the resort’s website or call 960-676-2828. Nestled between Florida’s Key West Harbor and Mallory Square, Ocean Key Resort & Spa— a luxurious oceanfront property located in the heart of Key West—invites romantic revelers to celebrate “suite” love in paradise with Cupid’s Suite Piece of Paradise Package. Featuring a three-night stay for two in a spacious Oceanfront Boutique Suite, the package indulges lovers with daily experiences at SpaTerre, dinner for two each night at choice of Hot Tin Roof or on private suite balcony, and daily waterfront breakfast for two. Package includes: 3-night stay for two in Oceanview Boutique Suite, two singles or one couples SpaTerre experience per day, dinner for two each night at Hot Tin Roof or on private suite balcony, and daily waterfront breakfast for two. Available through February 28, 2019, rates start at $1999 per night. Spa Ojai at Ojai Valley Inn. Spa Ojai at Ojai Valley Inn is offering the Couples Kuyam, which is a perfect wellness ritual for couples. The Chumash word "Kuyam" translates to "A place to rest together." Designed specifically for Spa Ojai, a Kuyam takes place in a Moroccan-tiled room at at temperature of 130 degrees. Guests self-apply three types of healing clay all over their bodies and relax into a 30-minute guided meditation (recorded by a Chumash elder specifically for this service). the while, the lights are dim while steamed lemongrass provides a lovely inhalation therapy. At the end of the meditation, guests rinse the clay off in a private shower and rest on a private patio to allow their core body temperature to cool. The Kuyam is an amazing experience on its own, or can be followed by a couples massage in the fireplace Sunset Suite. To book, visit the spa’s website or call 855-697-8780. To book, visit the resort’s website or call 954-556-7600. Penelope & The Beauty Bar. Pamper your hard-working soles with a luxurious 40-minute treatment that will leave them feeling like new at Penelope & The Beauty Bar, located inside Seattle’s historic Fairmont Olympic Hotel. Your feet will be exfoliated and nourished with a signature scrub, then a skilled therapist will gently work the reflex areas of the feet. A calf massage will loosen up tired muscles and release any toxins that were broken up. Cost: $149 (non-members), $125 (members). To book, visit the spa’s website or call 206-438-1750. Spa on the Plaza at Portola Hotel & Spa. To book, visit the spa’s website or call 831-647-9000. The Ritz-Carlton Spa, Los Angeles. Inspired by Los Angeles chocolatier Compartes popular Rosé Wine Pink Chocolate Bar, this twist on the traditional hot stone massage offered at The Ritz-Carlton Spa, Los Angeles uses fragrant chocolate and rose essential oils with heated rose palm and basalt stones to relax knotted muscles, relieve tension, and soothe the soul. After the massage, guests can relax with a chilled glass of rosé and a Compartes Pink Chocolate Bar ($275/80 mins). To book, visit the spa’s website or call 213-763-4400. SE Spa at Grand Velas Los Cabos. This experience at SE Spa in Grand Velas Los Cabos includes a couples aromatherapy massage followed by time in the spa suite’s heated plunge pool. The effect of the aromatherapy stimulates emotional and mental energy, helping to improve the connection as a couple. After the massage, couples enjoy 30 minutes of relaxation and privacy with mimosas and seasonal fruit. The Meeting of Two Souls Ritual (110 min/$368 per person) is part of the spa’s Yaakunah Love Ceremonies. To book, visit the resort’s website or call 888-505-8406. The Seagate Hotel & Spa. Nestled in the charming and quaint town of Delray Beach, The Seagate Hotel & Spa provides an intimate, romantic setting this Valentine’s Day that captures the relaxed-yet-vibrant lifestyle of Florida’s Gold Coast. This Valentine’s Day, couples can book the hotel’s Romance Package that includes deluxe accommodations, a complimentary bottle of Prosecco, and chocolate-covered strawberries, plus a dozen long-stemmed red roses. To enhance the romance, couples can relax in the 8,000 sq. foot Spa with the hotel’s Cupid’s Crush Treatment. The February special includes a Pink Himalayan Salt Glow and Salt Stone Swedish Massage, an ESPA personalized facial, and a refreshing Champagne and Strawberries Manicure & Pedicure. Offer valid for two-night stay in deluxe accommodations only. To book, visit the hotel’s website and use online promo code “HNYMN” or call 1-877-577-3242. Enjoy 30 minutes of lounge time in the private quiet room at Spa Le La in Studio City, California with champagne and strawberries, followed by two 50-minute massages. Cost: $190. Valid from February 14-17, 2019. To book, visit the spa’s website or call 747-227-4338. Guests will receive a complimentary box of chocolate truffles when booking the Sweetheart Package and other Valentines Day-themed spa treatments at Spa Mandalay in Las Vegas. Available throughout the month of February, this package is guaranteed to make this Valentine’s Day one to remember. Includes: 50-minute Sweetheart Massage, 50-minute Love Your Skin Facial, and 50-minute Heart and Sole Pedicure. Cost: $360 per person. To book, visit the spa’s website or call 877-632-7300. Spa Pechanga at Pechanga Resort & Casino in Temecula, California is offering a Couple’s Package that includes: one-night stay, in-room champagne and chocolate truffles, 50-minute Signature Massage for two in the couples’ massage room. Cost: $359-$649. The Spa is also offering a Single’s Awareness Day Special that includes: one-night stay, $50 dining credit, $20 free play per room, 50-minute Himalayan Salt Stone Massage for one, mini champagne, self-care gifts, and a complimentary upgrade to a Studio or Suite category room upon arrival. Cost: $299-$409. To book, visit the spa’s website or call 951-770-8501. Spa Valmont at Plaza Athénée NYC. For the month of February, Spa Valmont at Hôtel Plaza Athénée NYC will offer a special three-hour package that includes a 90-minute Signature Facial, 90-minute Signature Massage, complimentary eye collagen mask, and a glass of champagne. Cost: $645. To book, visit the spa’s website or call 212-734-9100. Fare Miti Spa Suite at Four Seasons Resort Bora Bora’s Te Mana Spa. Set over the water, the luxurious Fare Miti Spa Suite at Four Seasons Resort Bora Bora’s Te Mana Spa offers couples treatment tables (with floor windows looking down into the lagoon below), as well as a full bathroom and outdoor deck with soaking tub. Guests enjoy their treatment inside the suite, then spend time on the deck for relaxing, a coconut milk bath, etc. To book, visit the spa’s website or call +689-40-603-170. Love is in the air this Valentine’s Day at The Henderson, a Salamander Beach & Spa Resort with the Salamander Spa Destination Package. Spoil your significant other with a romantic getaway located just steps away from sugary-white beaches and emerald waters of the Gulf Coast. Special offer feature includes: luxury accommodations; two 50-minute spa services per person, per night; access to all fitness facilities and scheduled classes; access to swimming pools and spa facilities; Salamander Spa gift, tote bag and sports water bottle. Cost starts at $250 per person/per night. To book, visit the resort’s website or call 1-855-741-2777. At The Salt Studio in Pasadena, California, guests can choose from an array of cacao-rose treatments for the face and body, purifying and activating with the sacred marriage of heart-and-body nourishing (and age-defying) antioxidant delights within pure cacao and beautiful rose. Offerings include a 90-minute Cacao-Rose Body Scrub & Massage ($145) and a 75-minute You Are Sacred Cacao-Rose Facial ($145). The 2 oz. Cacao-Rose body polish used in the treatments is also available for purchase ($9.95). To book, visit the spa’s website or call 626-765-6180. This relaxing experience for two at The Spa at ARIA in Las Vegas incorporates warm Himalayan salt stones into a custom massage, creating a deeper sense of relaxation. Helps to ease muscle tension, allowing stress to melt away while enjoying a soothing environment. Cost: $230 per person/weekdays; $245 per person/weekends. Other Valentine’s specials include a Rose Quartz Chakra Facial ($285/50-min; $375/80-min) and Himalayan Salt Stone Manicure & Pedicure ($100/50-min manicure; $145/50-min pedicure). To book, visit the spa’s website or call 702-590-9600. Pedicure with rose-infused waters and chocolate peppermint brown sugar scrub at The Spa at Lincolnshire. Indulge in a spa package for 2 at The Spa at Lincolnshire in Lincolnshire, Illinois which includes: two 50-minute essential massages, two 30-minute chocolate and rose-inspired pedicures. Soak away in a rose petal-infused foot bath to soothe away your cares as the chocolate-peppermint sugar scrub moisturizes and exfoliates tired and dry skin. Your pedicure is completed with a luxurious body butter and choice of nail polish. Valid from February 14 - February 16, 2019. Cost is $250. Guests can elevate their experience with a complete Valentine’s Day Getaway Package. To book, visit the spa’s website or call 847-478-5795. The Spa at The Mirage. Guests will receive a complimentary glass of champagne when booking special Valentines Day treatments available throughout the month of February at The Spa at The Mirage. Heart’s Desire is a couple’s aromatherapy massage that can be customized with a wide variety of essential oils. Cost: 50-minutes ($170/per person), 80-minute ($215/per person). To book, visit the spa’s website or call 702-791-7146. The Spa at Sanctuary Beach Resort. Everything is better together with this package at The Spa at Sanctuary Beach Resort in Marina, California, which is available throughout the month of February and includes an 80-minute Couples Hot Stone massage, and a glass of sparkling rosé wine. Also included is 20% off the rose quartz bundle, which includes the Rose Quartz Facial Roller & Rose Quartz-Infused Gentle Mineral Toner for an extra glowing radiance this Valentine’s Day. To book, visit the spa’s website or call 831-883-5529. Capture the essence of romance during Valentine’s Day with this special package at Tideline Resort & Spa in Palm Beach, Florida. The couples treatment begins with a Champagne Body Exfoliation, followed by the Spa’s signature Hot Stone Massage. After indulging in more than two hours of high-end body treatments, couples finish the day with chocolate-covered strawberries and a champagne toast. Cost: $275/package. To book, visit the spa’s website or call 561-540-6440. This indulgent and deeply satisfying experience for couples at Tomoko Spa in Beverly Hills starts with The Ashiyu, Detox Foot Soak, followed by the signature Tomoko Massage. Afterwards, couples can further unwind in a private Ofuro (Japanese natural Hinoki bath). The whole experience culminates in a decadent en suite sushi meal for two. This treatment includes the following: private suite with shower and tub, sushi, organic teas, and Japanese sweet delicacies. Guests that book this package and come in during the week of February 10 - 18, 2019 will receive an exclusive essential oils gift. Cost during weekdays is $650 (75 min), $770 (90 min), $890 (105 min), $1000 (120 min) minutes, including 15-minute Detox Foot Soak (Total Time: 2.5-3.5 hours). Cost during weekends and holidays is $690 (75 min), $810 (90 min), $930 (105 min), $1040 (120 min). To book, visit the spa’s website or call 310-205-7300. YO1 Wellness Resort in New York. Ayurvedic retreat, YO1 Wellness Center in the Catskills, is offering 30% off Valentine’s Day Weekend at its stunning property located two hours outside of NYC. Perfect for couples and solo travelers looking to get away from it all, the luxurious weekend will include healing Ayurvedic therapies, yoga, naturopathy and state-of-the-art accommodations to rejuvenate the mind, body and spirit. Rates are all-inclusive of therapies, meals and accommodations. Stay must be at least two nights and take place between February 13 -18, 2019. To book, visit the spa’s website or call 855-200-6004.